Midnight Sun (directed by Scott Speer) could be described as being quite hard to pin down. Whilst somewhat messy at times, it is nevertheless unified by a pervasive tone of uplifting stoicism. To disclose that main character Katie Price (Bella Thorne) suffers from a rare condition known as XP – which makes her dangerously hypersensitive to the sun – gives nothing away: it’s revealed at the very beginning of the film. There is a certain charm (strangely combined with a punchy quality) to the straightforward, informative description voiced by the protagonist, but it’s not exactly subtle – perhaps this was not the aim. The game of this movie is to play on the emotions of the audience, which it does with a surprising degree of efficacy. Unfortunately, however, the feature certainly isn’t understated, and – perhaps excluding the introduction – it would benefit from being so. 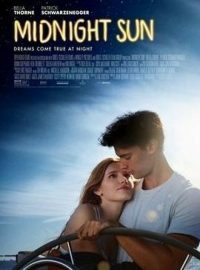 Too much emotional manipulation, especially when it is poorly cloaked (either by flimsy acting, overly loud music or clichéd script), can cease to be convincing – even when it remains effective, as it did in Midnight Sun. Having said that, Thorne’s acting is strong throughout, and she radiates a gracefulness that does not take itself too seriously: she gets the awkward, love-struck teen absolutely right. Her sweetheart Charlie (Patrick Schwarzenegger) – although starting off a bit wooden – likewise becomes noticeably more comfortable as the film went on. This seems to happen more generally as well. In the first half, the picture doesn’t make it too far past “fairly shallow first-love flick”. Without giving anything away, however, when the inevitable conflict arises in the all too perfect and innocent romance, some actual substance emerges. It is as if Speer et al discover the potential depths of the story when it is in full swing and, to their credit, do everything they can to realise them before it finishes. It is hard to say whether or not this effort is successful. The work as a whole is definitely very funny – even in the midst of the most emotionally intense moments (which work very well) – and by the end very touching, but there is a rather generous portion of surface-level teen politics and glossy, somewhat contrived gooey-eyed fawning. To conclude, then, it could be said that Midnight Sun is a good concept that is – for the most part – well played out, but not anything to write home about. Midnight Sun is released nationwide on 30th March 2018.